And they say dead men tell no tales. "Little does she realize pirates always have ghosts...!" Sometimes the most scurvy and fearsome of Pirates, even after being sent to Davy Jones' locker, just don't stay in their watery graves. Instead, they continue to terrorize the seas as fearsome undead scourges, complete with a Ghost Ship crewed by the damned. Despite the name, the Ghost Pirate trope includes all forms of undead pirates, including zombie or skeletal variants. Occasionally, their sojourn as the living dead is due to a terrible curse that keeps them sailing (which may or may not involve voodoo). Other times, they're just too tough to stay in hell. Legends of ghost ships and ghost pirates alike may derive from the tale of the Flying Dutchman, a phantom ship reportedly doomed to sail the oceans for eternity. Of course, not all Ghost Ships have ghost pirates. This is a common form of Ninja Pirate Zombie Robot. While she does not look the part Captain Liliana from Queen's Blade Rebellion is an Undead Pirate Captain - the members of her crew, on the other hand, are little more than walking skeletons. Brook is a living skeleton brought back by the powers of his Devil Fruit after he died once. Surprisingly for this trope, he's a good guy! Gecko Moria's crew, of which only four members are alive, the rest being zombies. Perona is a new take on this, as her Devil Fruit allows her spirit to leave her body, essentially giving her a ghost form. Subverted with Vander Decken, who sails on the infamous underwater ship Flying Dutchman like his real-life counterpart and is believed to be a ghost pirate on a cursed ship, but actually is just a regular fishman pirate. Rather than being the ghost of the infamous Vander Decken, the one the Straw Hats encounter is actually his great-great-great-great-great-great-grandson Vander Decken IX. Not that it makes him more of a nice guy. The pirates from Berserk are more like Technically Living Zombie Pirates under the control of an Eldritch Abomination. At least two ghost pirates have appeared in The DCU, both of them historical characters that used to have their own series. The Black Pirate appeared as a ghost in Starman and Captain Fear in the Dr. Thirteen mini-series. Bizarrely, Captain Fear might be able to die again, implying that there are tiers for this sort of thing. Tales of the Black Freighter, the Show Within a Show from Watchmen. In one Hellboy story, the titular character fights an undead Blackbeard. Man-Thing features a shipful of these laboring under an ancient curse. Requiem Vampire Knight: The Pirate Guild in Requiem is comprised of ghouls and skeletons who go around in flying ships. This doesn't make them particularly special however, given that pretty much everyone on the planet is some form of undead monster. Minor villain The Baron in Nikolai Dante is an over-the-top voodoo master with an all-zombie crew. This lets him keep his crew for the battle royale, since the rules stipulate he be the only person on his ship, but corpses aren't people, right? Admiral Gideon Gorelieu, in The Haunted Mansion: Mystery of the Vanishing Hatbox, is the ghost of a pirate, and still wears the grand, shiny admiral suit, although he doesn't sail the sees but rather haunts the manor he bought with his loot at the end of his life. Cortez appears in the Fusion Fic Yu-Gi-Oh! The Thousand Year Door, and he's still a ghost, but his appearance, attitude, and backstory mark him a completely different character than the one in the game. The Pirates of the Caribbean series has so far featured four distinct and separate varieties of undead pirates. In The Curse of the Black Pearl, the titular curse renders the crew of the Black Pearl immortal, but when under moonlight they're revealed to have turned into skeletal zombies. The crew of Davy Jones' ship (the Flying Dutchman) from Dead Man's Chest and At World's End is comprised of pirates who died at sea. They are immortal, and turn into sea creatures or get absorbed by the ship over time. On Stranger Tides has the Voodoo Zombie crew that serve Blackbeard on the Queen Anne's Revenge. They are the corpses of once-living men who were raised by Blackbeard through dark voodoo magic. Now they serve him without hesitation, as they have no free will of their own. Only the officers are zombies though; the sailors are normal men recruited unawares. The fifth film Dead Men Tell No Tales features Captain Armando Salazar and his crew, who actually are ghosts. They're technically pirate hunters rather than pirates themselves, but the effect is much the same. DVD menus of the original version of The Fog make it seem that the film's ghosts were pirates (as the menus show a hook handed one) but they are actually a leper colony who drowned with their ship. The horror film CrossBones had a zombified pirate killing contestants of a reality TV show. A demonic pirate unleashed from a chest is the antagonist of Jolly Roger: Massacre at Cutter's Cove. Curse of Pirate Death has a ghost pirate offing students and other random people who discover his treasure. Los Dark, the villain of the Kaizoku Sentai Gokaiger movie. "Skull and Crossbones" segment from Campfire Tales (1991) tells a tale of two pirates who wash ashore of an island with cursed Pirate Booty. Anyone who tries to take the treasure and/or leave the island has to face the reanimated corpses of the other pirates who got stuck there. The 1968 Disney comedy Blackbeard's Ghost is built around this, as one might expect. Protagonist Steve accidentally summons the ghost of the real-life pirate Edward "Blackbeard" Teach (hammed up by Peter Ustinov) from Limbo, where he had been cursed to stay by his spiteful wife. Only Steve can see Blackbeard, and hijinks ensue as they scheme to rescue the historical hotel that bears Blackbeard's name. The hope is that this good deed will release the restless spirit. William Hope Hodgson wrote 'The Ghost Pirates' which you might think you would a trope maker, but by "ghost" he meant bizarre shadow people rising out of the ocean and by "pirate" he meant they take over and sink the ship it's set on. In L. Jagi Lamplighter's Rachel and the Many-Splendored Dreamland, a ghost directing Rachel to Pirate Booty (from a wreck, not from burial) is aware of this trope and assures her that because the pirates were not afraid of death, their ghosts do not haunt it. Vampirates features a flooded future world haunted by vampire pirates, one crew of which are not bad people, but a mutineer leaves the ship and goes off to make an arch-villain of himself. Supernatural: In season 8, Dean learns that his new vampire friend Benny's old coven used to raid ships in search of new victims. He quickly dubs them "vampirates". Jason's attempt to invoke this trope in FoxTrot provides the page quote. Paige was smart enough to tell him to not try it. Destroy the Godmodder had ghost space pirates that deserve a mention for surviving being the only things for the godmodder to target multiple turns in a row. They also had a massive ship that came back to life with them, and they even made a bunker when THAT got shot down. The Black Freighter of 7th Sea draws its undead crew from those who died at sea. The Pirates of the Cursed Seas set has an entire faction devoted to these. The standalone Games Workshop game Dreadfleet has one of these- Vangheist, captain of the Shadewraith. 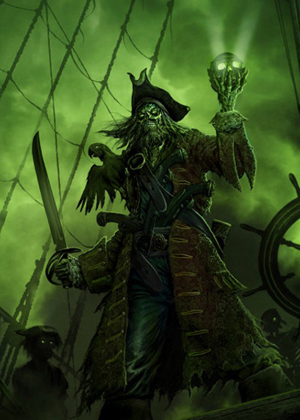 And if you take the broader "any undead pirate" definition, the entire Dreadfleet is crewed and captained by them! Count Noctilus is a vampire pirate, King Amanhotep is a mummy pirate, Skretch Half-Dead is a zombie Skaven pirate and Tordrek Hackhart is a cyborg Chaos Dwarf pirate who is no longer truly alive. The Warhammer verse has Luthor Harkon , a mad Vampire Count whose coffin washed up on Lustria, from which he leads an army of zombie pirate skeletons. The Warhammer Spin-Off Dreadfleet features mummy sailors crewing a pyramid on a boat, zombie ratmen piloting an also zombified deep-sea monster, a vampire whose ship has his castle mounted on it, a mechanical squid submarine... and a Ghost Ship. Rattle me Bones , a game where you must carefully remove items from a pirate's skeleton. If you lack dexterity, the skeleton will RATTLE AND SHAKE! The Bone Devil crew in Rum And Bones are scurvy skeletons. It gets worse for them; thanks to the nature of the setting the clashing pirate crews can never truly die. The other crews come back from death alive and hearty. The Bone Devils just rise as skeletons once more. Warmachine has an entire fleet of pirates led by a liche cyborg and a monster girl, so also has pirates of various states of undeath, mostly liches and zombies, with actual ghosts appearing aboard the "cinder ship", the Atramentous, which was the first ship of the pirate lords to attack Lord Toruk head-on, and set ablaze forever; the ghosts were of the crew clustered at the bow and most enthusiastic about taking on the dragon, and therefore most completely destroyed. The recurring antagonist of the Monkey Island series, the undead pirate LeChuck, is one of these. At least it explains why he keeps coming back in each game. Late in Tales of Monkey Island, Guybrush becomes a ghost pirate himself after being slain by LeChuck, but later finds a way to repossess his own body, and he's returned to normal at the end of the final chapter. Cervantes from the Soul Calibur series is a zombie/ghost pirate thanks to the power of the evil sword Soul Edge. Played with in Ratchet & Clank: Up Your Arsenal, which has some Undead Space Pirate Robots. An actual army of Undead Space Pirate Robots serve as the main antagonists of Ratchet & Clank Future: Quest for Booty. Cortez the Pirate King from Paper Mario: The Thousand-Year Door is a large collection of bones and commands a crew of ghostly flames. Chrono Cross has the player's party board a Ghost Ship full of pirates. They're actually just putting on an act, and aren't ghosts at all. Later, though, the ship is attacked by a real ghost ship. One of Vyse's specials from Skies of Arcadia involves summoning a pirate ghost to up the party's defense. Not to mention one of the discoveries that can be found in the game is a ghost ship. There's more than one quest chain in World of Warcraft involving undead pirates. The Forsaken navy, the largest in the Horde, has this as its main aesthetic. You can even play one yourself as an undead Outlaw rogue. In one point in Arcanum, you need to get a ship. There are three ways to do this, and one is by laying your hands on a ghost ship belonging to a cursed undead pirate. The main antagonists of Alone in the Dark 2 were a band of zombified pirates kept "alive" though voodoo. The Wario Land series has about one per game, with one unnamed boss in the third game, Captain Coin in the fourth game and the boss Captain Skull in Wario World being ghost pirates. Or pirate ghosts. Or both. Barboros' old crew appear as these in Zack & Wiki: Quest for Barbaros' Treasure. They're insta-kill as they scare you to death if you get to close. There are skeleton pirates in Final Fantasy V's Derelict Graveyard dungeon. There are a couple levels in the first world of Drawn to Life: The Next Chapter which involve ghost pirates, though they're only Baki which can float and cannot be punched. The boss of the world, however, is just a normal, old pirate captain... until one hit kills him and he turns into a giant ghost pirate. The antagonists of Sonic Rush Adventure are called the "Ghost Pirates", though they're actually not ghosts at all... more like robots. Fitting, seeing as Eggman and Eggman Nega built 'em. In Fable II one of the side quests in Bloodstone involves you fighting a fearsome pirate ghost in order to take control of his fully automated ship to reach his treasure. Ghost Pirates of Vooju Island has a main cast of not one, but two ghost pirates, and a ghost witch-doctor. Dubloon features both friendly ghost pirates and unfriendly zombie-pirates. The second Ben Jordan: Paranormal Investigator game has a Ghost Ship which is still haunted by its captain, determined to protect his treasure. Vega Strike flavour text on Neural Computer (cargo) says that one of their functions is maintaining a viable imitation while the pilot's brain is blacked out in a maneuver... which, since the computer doesn't always die with the pilot, "explain the reports of zombie mercenaries". The skeleton pirates in The Legend of Zelda: Oracle Games. Spinal of Killer Instinct fame is a skeletal example. His stage's background might apply as well: it's a galley full of skeleton rowers. The "Ghost Ship" level of the original MediEvil had you fighting your way through skeleton pirates to take over their ship. In Resurrection, the Updated Re-release for PSP, the level is preceded with a harbour filled with acrobatic skeleton pirates. Gangpank, the game's resident pirate king champion has a "Spooky Gangplank" cosmetic skin that gives him an appropriately spooky and ghastly makeover. A more canonical example comes from Pyke, who's more of a Revenant Zombie than a "ghost" per se, but regardless, he's a drowned harpoonist-turned spectral assassin tied to "The Swimming City". The Bermuda Triangle level in Impossamole has swarms of invincible pirate ghosts. In Mystery Case Files: 13th Skull, the player character is summoned to the Louisiana bayou by a woman whose husband has gone missing. Their young daughter maintains that a ghost pirate was responsible for his abduction. In Dota 2, Kunkka's backstory hints that he might have been killed in the crash that destroyed his ship. His appearance is perfectly human though. Foxy is this in Five Nights at Freddy's regarding that he's one of the shells for a dead child. Mangle picks up Foxy's paste in the prequel looking freaky as hell. In Thief II, Garrett can possibly encounter one while exploring the wreck of his ship. Stealing the pirate's loot causes him to appear as a Haunt, and Garrett then has to sneak by him in order to get away and keep the treasure. In Path of Exile, ghostly pirates and simply sailors comprise the bulk of the enemies encountered in the ship graveyard towards the end of Act I. One even serves as a treacherous Quest Giver! The Black Cove in Divinity: Original Sin is populated by undead pirates, including an undead pirate captain. Persona 5: Party member Ryuji Sakamoto's eponymous Persona Guardian Entity is a skeletal pirate standing atop a floating Ghost Ship. One of the major bosses in Darkest Dungeon are the Drowned Crew: a group of pirates cursed to drown forever by your Ancestor after deciding that their usefulness was no longer needed as they demand for more pay. A miniboss, the Squiffy Ghast, is suffering from the same fate. The Pirate King from Shantae and the Pirate's Curse. Well, once he came Back from the Dead. Khimera: Destroy All Monster Girls: The Zombie Pirate subtype: The Zambots, who are noted as "Undead Pirate" in the logbooks. In Total War: Warhammer II, the Vampire Coast is a group of undead pirates and aquatic beasts lead by a group of vampire pirate lords, under the leadership of the insane elder vampire Luthor Harkon. Plants vs. Zombies 2: It's About Time features a world called Pirate Seas, which is obviously infested with Pirate Zombies trying to board the player's ship and plunder their brains. There's a pirate ghost in the webcomic Eerie Cuties who's the gym teacher. In Homestuck, the both the alive and dead versions of Vriska Serket became pirates while both existed... it's complicated. Sequential Art has a zombie pirate, Ezekiel Pretz. The Repository of Dangerous Things got Pirate Girl ghost Wanderin' Laurie . Jackie Rose: The villain of the second season, is a female pirate captain/witch that can use magic named Blackburn. Heck even her crew are nothing but ghouls she controls. There were episodes of the original series which had (fake) ghost pirates. And in one episode, ghost vikings as well. Played with in an episode of A Pup Named Scooby-Doo, as a man impersonates the ghost said to haunt a house. His disguise is clearly pirate-themed. But the real ghost ends up not even being pirate-related at all. Talk about a Critical Research Failure. In Scooby-Doo on Zombie Island, many of the titular zombies are members of an undead pirate crew led by Captain Morgan Moonscar, who terrorized the island centuries ago. However, they are not (currently) villainous; the people who killed them are the actual main antagonists of the movie. Scooby-Doo! Pirates Ahoy! has some, although they turn out to not be real ghost pirates. What a shock! Hilariously subverted, because of the guy who really believes himself to be the descendant of the pirate that his conspirator just made up! The ghost pirate crew in the Kim Possible episode "Capt'n Drakken". The Flying Dutchman from SpongeBob SquarePants is a classic Ghost Pirate, who possesses many supernatural powers. He also acts as an underwater Grim Reaper, who takes the souls of dead sea creatures to Davy Jones' Locker (which is a literal gym locker filled with dirty laundry). In "Shanghaied", the Dutchman forces SpongeBob and Patrick to become crew members on his Ghost Ship, acting as "ghostly ghost pirates" (though they're still alive). They're... not up to par. Codename: Kids Next Door had an episode featuring ghost pirates, who were skeletons made of licorice. South Park: "Korn's Groovy Pirate Ghost Mystery". There is a discussion over whether they are ghost pirates or pirate ghosts. The Garfield's Halloween animated special has Garfield and Odie dressed as pirates and eventually encountering some real ghost pirates who come looking for their treasure. Subverted by The Venture Bros., in which the pirates were actually pulling a "Scooby-Doo" Hoax. Dean: Hey, it's that ghost pirate! Hank: Who isn't a ghost. ... Or a pirate even, really. Danny Phantom has Youngblood and his crew. Played with in "The Darkest Fathoms", the first episode of Jonny Quest: The Real Adventures. There's a pirate and his crew who dress like their counterparts from the age of sails, but it's also heavily implied that the ghost pirates they pretend to be are real as well. A group of ghost pirates appeared in one episode of The Pirates of Dark Water. They tried to capture Ioz and turn him into one of them. Since the only thing that could harm a ghost was another ghost, Ren had to have Tula use her powers to separate his spirit from his body so he could go fight the ghost pirates and save Ioz. The Real Ghostbusters had to deal with a crew of these who invaded New York to retrieve their buried treasure after it was uncovered and put on display in a local museum. The Zombie Pirates from World of Winx can change from humans to undead. An episode of The Fairly OddParents! had Timmy wish up a ghost pirate to tell scary stories. The ghost decided to tell the story of when he and his undead horde laid waste to Dimmsdale. Camp Lakebottom: Captain Spitbeard, along with the ghost cabin boy Swabby, in "Pirates of Ickygloomy". Goober and the Ghost Chasers met two on a ship named Dink and Dunk. The plot of the Defenders of the Earth episode "Kshin and the Ghost Ship" revolves around Kshin encountering a bunch of ghost pirates and helping them to find the compass they need to free themselves from the curse which forces them to wander the ocean for all eternity. In the pilot episode of DuckTales (2017), one of the ghosts accidentally released by the nephews is a pirate captain named Peghook. Growing Up Creepie pulls its Real After All running gag, which the programme uses incessantly, in an episode set at a beach where the characters decide to have a surf competition despite legends aying the area is haunted by the ghost of pirates who went down with their ship in the area. The stories turn out to be caused by small hermit crabs whose help Creepie keeps trying to avoid. At the end, they swim down towards a shipwreck and turn back into pirate ghosts. Castlevania (2017) features a variation of this trope with Godbrand, a Vampire Viking who is shown to have his own ship and crew of fellow vampire pirates, traveling through the seas to find humans to prey on.